I was not really feeling "fall" yet this season. I got my pumpkins and they are on my patio. My house is decked out with fall and Halloween decors. I enjoy the Halloween displays in my neighborhood during my evening walks as it gets dark earlier. It's just that weather is not cooperating. It gets chilly in the mornings but by noon, it gets warmer. It is by not means hot. Most describe the weather as gorgeous. Lovely but not fall sweater weather. And Halloween is only 4 days away! My Uggs are still in their box and my scarves are still neatly folded. Usually by now, I am all bundled up in coziness. (Actually, I should not be complaining because we had a freakishly record-breaking weather last year when summer would just not quit until a week before Halloween!) So maybe there is still hope. I might get my sweater weather in few days, hopefully. In the meantime, I unexpectedly got my fall feels today when Mr Sweetie and I went to a super-awesome pumpkin patch after our delicious brunch at Huckleberry's! I was not expecting it to be so magical! I have been to many pumpkin patches in the past but this one was the real thing! First of all, it is off the beaten path. It is located in Fairfield, CA which is just about an hour away from San Francisco. However, it is about 7 miles into the country back roads from the main road. We passed by farms and vineyards. On a country road, it felt far and remote. I found Larry's Produce on Instagram. I was expecting a small country produce market with a teeny pumpkin display in the back. Mr Sweetie and I went to brunch first and I told him that I wanted to check out Larry's to get some produce as I read that the prices are really good. 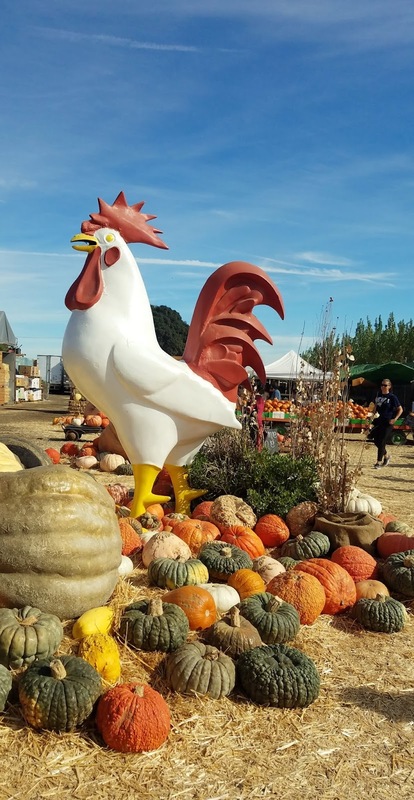 I was not expecting a real pumpkin patch with tons (figuratively and literally pumpkin weight-wise) of all kinds of pumpkins including fairy tale ones that look like Cinderella's horse carriage. I could not believe my eyes as we walked through the produce section and found pumpkins of all sizes and haystacks in a very spacious land bordered by cornfields. There was a haunted house and hayrides come every so often! There was a Mexican food truck, a Mexican eatery, shaved ice and kettle corn stands. So, just like a kid in a -- well -- pumpkin patch. I went crazy taking tons of pics, asking Mr Sweetie to take my pics, jumping on tractors to pose for pics, etc. In the end, we bought a few pumpkins and Indian corns. We ended our visit at the produce where we bought tons of veggies including dates, pistachios, heirloom tomatoes, avocados, artichokes, pasilla peppers, etc. Everything was just under $50 which was unheard given the amount of vegetables to took home! I read that it turns into a Christmas wonderland after the Halloween. We are definitely going back in December! What is fall like where you live?